Ray, as usual, excellent conversation. I’ve always found the idea of “just war” troubling, as there is no such thing. All wars can be traced to our sinful actions – as a nation, culture, and as individuals. This is one proof position that there is evil in the world and it’s source is us. This is made clearer for me in a supposedly democratic society in which we are told that we are obligated to participate, which involves our thoughts, our speech, and forms of speech – namely money. In this society, we have to participate in violence to some extent whether we choose to or not. I have gotten criticism from people who are conservative and liberal when I say this, but I cannot see any other explanation. For example, someone might not be an advocate of war, and might want to see the poor being helped. If they, say, contribute money to a particular politician who shares that belief, and the politician is elected to office, that politician may have to consent to advocating war, advocating a social policy that does harm to someone. One can say that the politician or the voter bear no responsibility because there are things out of their control. However, we live in an age in which it behooves us to know more about how the systems of the world work and again, are told from childhood that we have “rights” and “obligations” and have to participate. Intentionally or not, everyone in the chain is responsible. If someone votes for a president and that president has to order someone being killed, the blood is on the had of those who voted on him. That might not make us anathema to God, or make us exempt from forgiveness, but we are still sinning. We may have no choice but to “sin boldly” as Luther put it, but we should be always repenting. I use the example of money because in this country money is a form of speech. Jesus was as much concerned about speech as he was about thoughts and intent. Money can be used for good or for evil. Just like a hammer or an ax. The problem is we never see the result or consequences of our actions. As a nation, we never accept that policies can create monster nations who might come back to threaten us. Every war ever fought has been the result of sin and violence committed by individuals and nations decades before the actual conflict begins. Peacemakers are marginalized, ignored, mocked, or censored in this world of ours. Very infrequently are their voices amplified so everyone can hear them. As it was discussed in the conversation, the Christian thing to do in a violent situation would be to make yourself a shield between the victim and the perpetrator. That makes sense. As a nation, do we really do that? We know about genocide taking place in the world, but we don’t go to war mostly because it doesn’t concerns our interests. However, we will go to war when confronted with someone who is maybe less moral than us, but more vocal about his intentions (the first Iraqi war for example). But what we really do is protect our business interests and way of life (which involves over consumption) and are not really that interested in saving the victims of the violence. I honor those men and women who are called to out themselves in harm’s way, even for the interests of money. What concerns me about how we as a nation approach the issue of violence, though, is how we justify it with supposed moral imperatives which there are none, or these imperatives are not the priority, and we rationalize our killing of people (innocent or not) and think we are exempt from God’s judgment. We ultimately sanction violence on a national level. As individuals we are taught that what is ours is ours and no one else can have them. if you try to take my stuff I will call the government and put you in jail, maybe even your life depending if that stuff is your life. Sure, there has to be that mechanism to cause violence to prevent more violence, but the system is broken which is why “just” violence or the threat of that violence is allowed. That is not reassuring to me. That depresses me. I’m glad that the police are there to serve and protect, but it makes me depressed that they need to be there at all. That someone would want to inflict violence on me because they were so deprived of something they felt they needed to take it. Also, it depresses me that if someone wanted to take it from me, I would think they shouldn’t or can’t. As Christians, if someone threatens us and wants our money, shouldn’t we happily give it to them and not worry? Ideally that is what Jesus is talking about. I don’t think that when he told the disciples to get a sword when they go on the road he meant literally. They had to arm themselves because of the violence that awaited them, as we do now. But it’s that condition of the world that is so depressing. What I struggle with on that level, in this world in which we are supposedly battling principalities and spirits NOT of this world but supernatural, that God doesn’t seem to be doing anything about it. Why didn’t Jesus cure blindness, then, and not just a couple of blind men? We are told that Jesus defeated death, which is born in violence to God and between humanity. I have to admit that I don’t buy it. Of course, these are other more complex theological issues, but they are all related to one another, no? Wow- thanks so much Ray for this enlightening discussion. Also a huge thankyou to Josh and everyone at “A place to talk” for letting us join in on the conversation you are having about non-violence. I greatly appreciate the honesty of everyone involved. It’s enriched me and given me wonderful insight into this very emotive topic. Wow Ray, I’m glad you posted this. I had a great time having you at aplacetotalk. Non-violence has come up in nearly every conversation since you were last here. Some are getting it and are actually changing to be less violent in their everyday lives and words, and others are still fuming because of this idea. But I’m so glad we had the conversation. Have a great day. You don’t happen to be going to Late Night with Roy tomorrow do you? If you are, call me and I’ll look for you there! I agree that it stands to reason that the way of Christ is completely other, foreign to us. therefore we shouldn’t be surprised if his solution rubs us the wrong way and seems to make little to no sense to our natural human way of thinking. We’ve been surrounded by systems of thought both in the church and the world since birth that work contrary to the heart of Christ. As a missionary kid watching the machine of evangelistic effort all my life I have witnessed both the beauty and tragedy of missionary efforts in a fallen world. My simple conclusion is that God is indeed powerful and gracious to make use of the fumbling efforts of us broken people to advance his kingdom. Somehow his kingdom still advances. it is both sad and yet cause for rejoicing when we take the focus off of ourselves and see what He is doing. 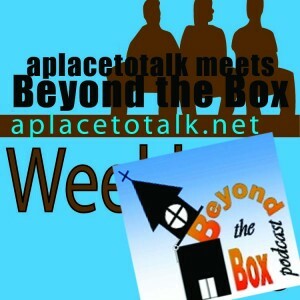 Thanks for sharing this discussion with us and may the ripples be far reaching in His kingdom. It’s pretty brief, not a full treatment of the subject but just an excerpt that basically looks at the rabbinical models of teaching that Jesus always seemed to pattern after. The Remez method of “hinting” at a scriptural reference seemed to be a constantly reoccuring pattern for him and make sense of so many passages that have been a mystery to me in the past. Perhaps it’s a bunny trail but I have a hunch that your curiosity will see it as relevant since it was mentioned in your conversation. While Christ gave up his divinity I yet see him as the most intelligent teacher that ever lived and perhaps not in need of the kind of stall tactics I might pursue…although I hear the humor and “grain of salt” in your reflection about his humanness. I DO think of him as more profoundly human than I was ever taught to believe in Protestant Evangelical circles. much respect and gratitude to you. Thank you for SOOOO much fuel for my soul over the last few months. I remember reading Joe Amaral’s “Understanding Jesus” a few years ago, which covers his explanation of the writing in the sand incident (based on a first century Jewish culture context). I thought Joe offered some great insights, however what bummed me out about this section in John’s gospel was the footnote that the earliest manuscripts do not have John 8.1-11. What a way to bum out a great story. To me however, it still sounds like something Jesus would have done. Can I get the list of books you recommended?